Does your social plan account for crisis responses? Even if a post or comment seems harmless, your followers might be confused by the sudden shift in messaging. Create guidelines for responding to posts or comments during a crisis. In most internal cases, an offending post should be deleted – and a correction or apology quickly offered. For external comments, evaluate the content before deleting it – most followers won’t appreciate being silenced on the company page. Don’t let offending posts linger on your account. Pull them immediately, and issue an apology or retraction. This shows that you are actively monitoring your social channels – and that you give great weight to your brand’s social reputation. Follow up on this retraction post by responding to user questions and concerns, so it doesn’t look like you’re trying to hide from the crowd. 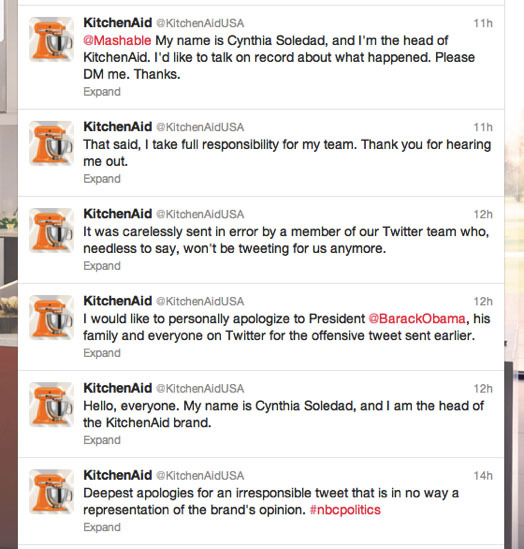 When a rogue tweet was sent criticizing President Obama on the KitchenAid account, the company’s senior director of marketing took control and invited followers to discuss the issue. The worst crisis response on social media is the copy-and-paste response. Companies use this to blanket networks with the same prepared remarks, often in direct response to consumer questions and comments. Such a strategy leaves the company in reactionary mode, flailing their virtual arms and hoping things will get better. Applebee’s found itself under scrutiny earlier this year after they fired a waitress for posting a customer’s receipt on Facebook. 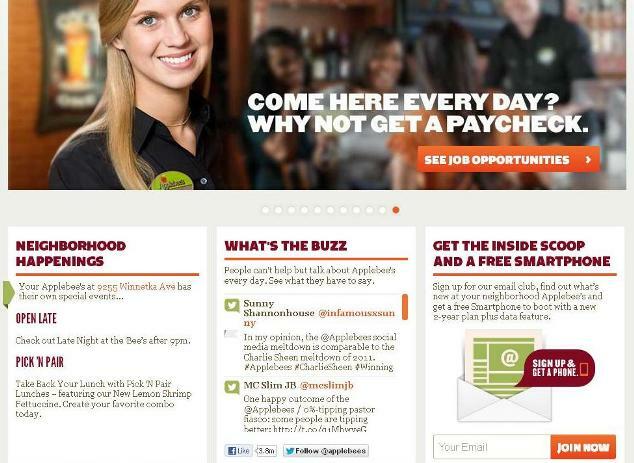 Users flocked to the company page to express their frustrations – which prompted Applebee’s to commit several sins of social media. Effective crisis response begins by putting a sincere, human face behind the messaging. When a company resorts to copy-and-paste social crisis management, all sincerity and authenticity is instantly lost. It’s a gutsy move to respond with humor, so make sure your audience can get the joke. Otherwise, you’ve only made the problem worse by appearing aloof and desperate. Social management programs like HootSuite are valuable for organizing your content, but they can also disrupt your crisis response at exactly the wrong time. As you respond to the situation, make sure any previously scheduled marketing posts aren’t published in the meantime. It doesn’t help your brand to publish unrelated content as you manage your response. Suspend scheduled posts until you’ve fully addressed the situation according to your social management plan. This should also be done in the event of a national or global crisis, so your brand doesn’t appear disconnected or insensitive. After the crisis has died down, evaluate your social team’s strategies and tactics. Research new ways to control social content, and revamp your crisis plan based on feedback from followers. Learn from your mistakes, and you’ll be less likely to repeat them. Social media communication is instantaneous, and it can magnify mistakes in seconds. Use these tips to prevent brand miscommunication, and ensure your social management plan is fully equipped to handle crises. Your brand’s online reputation can survive an accidental tweet or post – but only if you act fast to remedy the situation. Does your company have a social media crisis plan at the read? What monitoring tools are you using to stay on top of potential developments? How to Control Your Online Reputation and Identity – Italian Language Book Available Now was originally published on BruceClay.com, home of expert search engine optimization tips. In the age of Google, it might take even less than five minutes to tarnish a reputation. Consider that just one 140-character message directed to a journalist can catalyze the unraveling of a corporation or a celebrity and spark a stain-covered search results page. 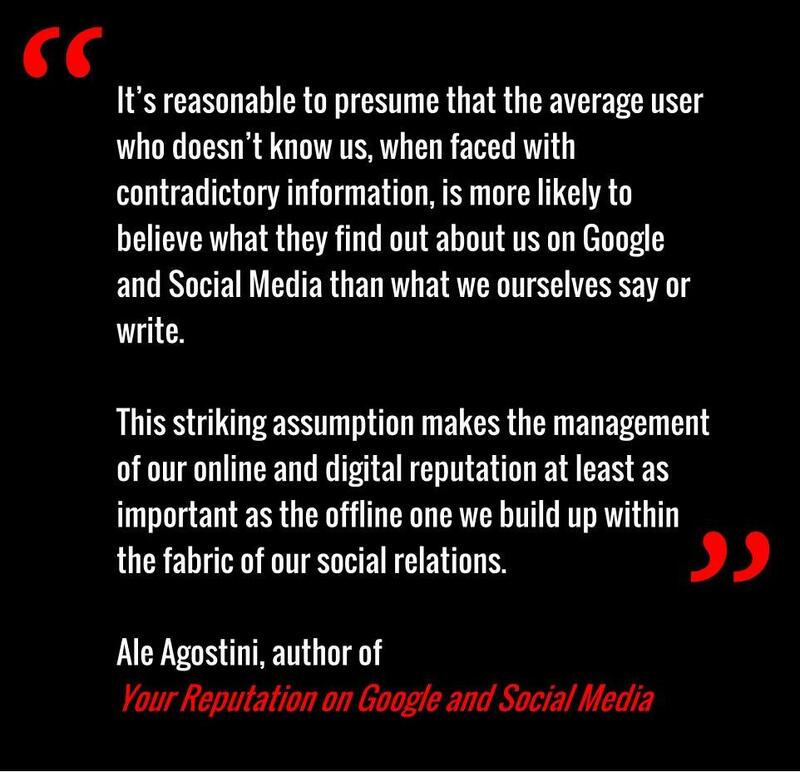 Bruce Clay Europe’s director Ale Agostini has written a book in Italian about Your Reputation on Google and Social Media, titled just that. With a third of the world’s total Facebook population residing in Europe (Internet World Stats data from Dec. 2012), this book covers territory that everyone should be aware of as they conduct their business – personal and private – online. Many people today draw most of their information from search engines and social platforms rather than from spoken conversations and word of mouth; this has given rise to the coining of the verb “To Google”, a term used to refer to the online search for information as a basis for decision making in real life (purchasing a holiday, hiring an employee, short listing a supplier). Research carried out by Google (ZMOT) showed how on average in 2011 consumers used 10 different sources of information during purchase operations, as opposed to the 5 sources accessed in 2009; in other words the bulk of fresh and immediately available information online has broken down the information asymmetry between the opposing parties, redressing the balance and providing a very broad information platform to anyone capable of acquiring information online on anything that interacts with the real world (companies, products, services and people). So today, when faced with something they are not too clear about, many people try to bridge the information gap by turning to digital information sources that contain more or less reliable/updated information. If to this we add the conclusions reached by B.J. Fogg in his research on interaction between man and machine which in a nutshell claims that “the more a user uses a digital instrument with a positive outcome, the more they trust that instrument”, it’s reasonable to presume that the average user who doesn’t know us, when faced with contradictory information, is more likely to believe what they find out about us on Google and Social Media than what we ourselves say or write. This striking assumption makes the management of our online and digital reputation at least as important as the offline one we build up within the fabric of our social relations. Search engines (Google, Bing and Yahoo) and the most commonly used Social Media (Facebook, Linkedin and Twitter) determine our image and reputation in the eyes of those who know us less: however, the individual user has very little control over these 2 giants of online communication. 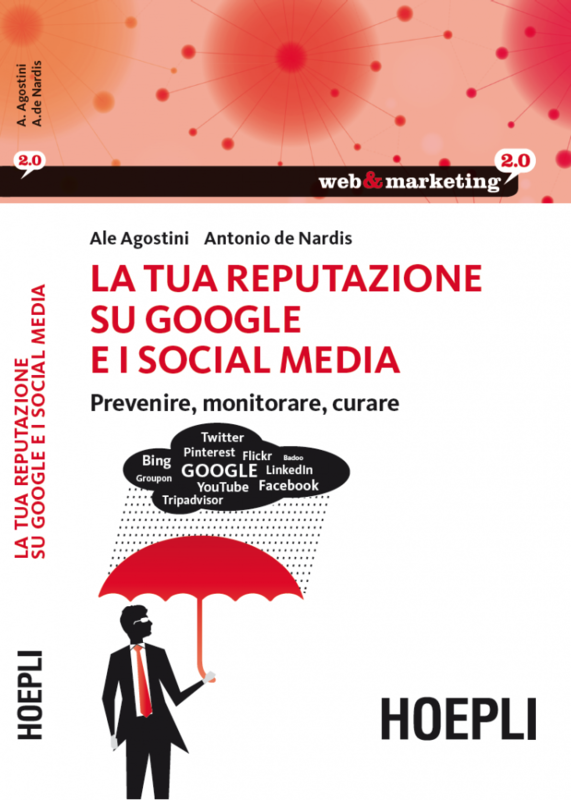 The book Your Reputation on Google and Social Media (original title in Italian La tua reputazione su Google e i Social Media) helps the user to understand how these search engines and Social Media (mainly Facebook, Twitter and Linkedin) work and the best tools and procedures one might adopt to successfully manage our image as it transpires from a search based on name and surname (or vice versa). Remember back in the day when search results were just ten blue text links on a page? Back then, the search results were so simple that reputation management was pretty straightforward. You could clearly see if those blue links connected to positive content — if so, your reputation was great…. Comments Off on A Threadwatch Best Post Revival. Most believe SEO is a skill in itself and once mastered can be used to orchestrate successful campaigns, a belief that couldn’t be farther from the truth. Instead, one needs to learn many different sets of skills in order to truly understand SEO. Directories Started Losing Their Value…8 years ago. We all know in recent years that the value of link building via directories has dropped significantly, but many act as though this is a new thing. The discussion has been going on for a lot longer then you think. The Debate Over the Lifespan of SEO as a Profession. It’s far too clear today that reliance on certain types of SEO practices as your only way to pay the bills can ruin your business when big daddy Google waves his hands and updates the algo. What’s interesting is for how long the “death of SEO” discussion has been taking place (hint:forever). Yet Another Monster Link Building Post. They never get old, believe it or not. A nice set of resources to re-visit, and see whether or not these various link building tactics can still be used, are still relevent, or possibly even considered penalties in 2012. Great inspiration for those off-page campaigns. It’s hard to imagine a time without no-follow links, forcing users to sign in to Facebook or just all together not moderating comments and letting threads run free. Well, at one point spamming was a much bigger issue, and it’s interesting to see how we got to where we are today. Anyone who knows their SEO lingo should be able to spout off the standard list of Google filters like they do their ABC’s, but if you need a good introduction this thread has it. Also includes a good discussion about early duplicate content filtering. I’m only including this here to remind everyone to remain humble, no matter what industry you’re in. These sites were once huge considerations, and now account for a very small percentage of search and social market share. Even the giants can fall. Long before the days of Google celebrity Matt Cutts shooting videos explaining algorithm changes and updates, us SEO folk had to figure it out for ourselves. Here we see Google finally taking PR approach to anckowledging SEO. Clickstream and user data has evolved into a large part of the algo. Here’s some insights as to where it started. Over the years SEO’s have ousted big brands not playing by the rules Google has set forth, only to complain when those brands were not penalized in a harsher manner. Unfortunately these brands ARE relevant to consumers and Google will always have their backs (and Adwords budgets). Google’s reaction to blog comment spamming with “no-follow” lead to the idea of page sculpting, where sites would hoard their link equity. Google’s attack on SEO’s was met with an unexpected counter offensive. The idea of page sculpting has been revisited often, in this case during the no-follow frenzy. If you really want to get a web developer or SEO fired up about “how the search engines” think – this is a great discussion. Make sure to introduce the ideas of “black hat and white hat” as well. Truth is it’s likely never been a direct factor, but well written code has a multitude of other benefits that indirectly aid in search rankings. When MySpace first arrived on the scene it denifnately got “used” by spammy types creating pages for products and brands, never really developing a mature method of advertising options. But the seed was planted that social networks would lead to marketing and advertising opportunities down the road (in other words, Facebook). 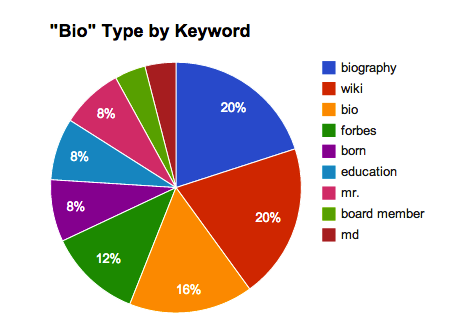 One of the problems with this industry is everyone wants to be talked about, wants to be in the SEO spotlight. Yes, blogging can help bring you exposure and business if you know how to create a conversation, but it’s not essential; many of the world’s greatest SEO minds do so without ever writing an article. As much as we optimize and scrutinize the search engine, one must not forget to think about other traffic sources and visitor retention. 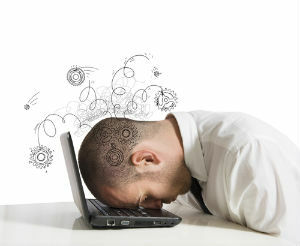 The search engine is a tool but for marketing, but too much dependance will always cause problems in the long run. Once upon a time the “sandbox” was a place new or penalized websites went and couldn’t rank for anything. Purgatory would have been a better nickname, when the God-like Google judged your worth. If you got to experience the Digg effect, you know it was fantastic to be able to crush a server with raw social traffic. R.I.P. digg. If you think the recent Panda/Penguin/Insert Stupid Algo Name here updates hurt webmasters, know it’s been going on for years. The same sob story about how Google “ruined” a business that didn’t have a solid buinsess model to begin with. Anyone using or talking about Squidoo today? Didn’t think so. The title of this thread alone spells out what went wrong with seth’s fact site. We can all read blogs and forums until our eyes pop put of our head, but if you’re running a business you need to know the fundamentals of lots of things – finances, economics, marketing (outside of the web). Take the time each month to digest a classic, it will put everything you do online into perspective. It’s amazing reading a thread like this that discusses quality indicators (on-page) that people to this very day still do not prioritize. Eight years later and many of these are a playing a big part in how Google views your site. It’s pretty crazy to think that you could get sued over some random person commenting on a blog post you wrote. But it happened! A straight-up simple but killer thread on how to get into the right kind of mindset to get links. Today there are more social factors involved which makes this mindset all the more important. Understanding the metrics and determining why a link is valauble then determines the monetary value. Public service announcement – don’t buy links! A thread about an old post I did, in the heyday of link building the link request is what coined the term “link ninja”. It’s all about getting your foot in the door. Just because you are good at optimizing web pages doesn’t mean you can help a business. Fundamentals of every aspect of business is also required to be a great SEO. One of the more interesting ways Google has tried to penalize webmasters over the years is by putting the handcuffs on a site’s PageRank. It still shows up but the theory is a penalized site won’t pass the juice. Yes it was the stone age, a time where everyone saw the same search results. Then along came personalized search and things became more complicated. Even to this very day it’s quite interesting how the public percieves what it is we do. A good discussion every SEO should sit back and have with someone outside of the biz. After Penguin hit last year, everyone began crying about the possibility of “negative SEO”. Truth is it’s been around for years in the form of “Google Bowling”. Once the big G started figuring out they could get more bang for their buck by managing client accounts themselves, they went after the big accounts. Don’t be fooled by their complimentary assistance – they want you to buy more ads! Michael Gray aka Graywolf breaks down a patent that still holds up as a good basic understanding of what Google’s looking for. 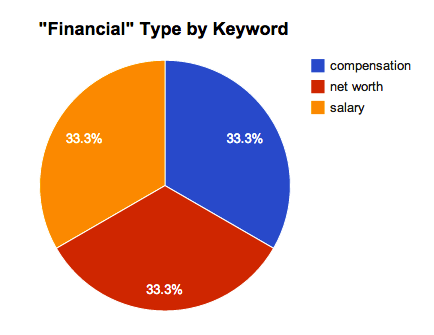 While many new factors exist, this is a nice breakdown that every SEO should know verbetum. What color hat do you wear? The distinction between different styles of SEO will continue to be a question clients ask. While black-hat used to get the job done the more Goolge flexes it’s muscle the less their tactics will be effective. The SEO Game is Getting Harder? Puhleeze! It’s amazing to think how good we had it back in 2005 – and even then we new the game was getting harder. Those who really paid attention were smart enough to see most of the updates we complain about now coming from a mile away. It’s funny to read some of the comments in this thread, as we have some doubters here. RSS reader user metrics influencing spam removal? Makes total sense. Who would have thought that search would result in a major brand’s PR struggle. It happened with one of the most hated companies in the world, so they struck back SEO-style. Search Engines NOT Hand Checking Results? 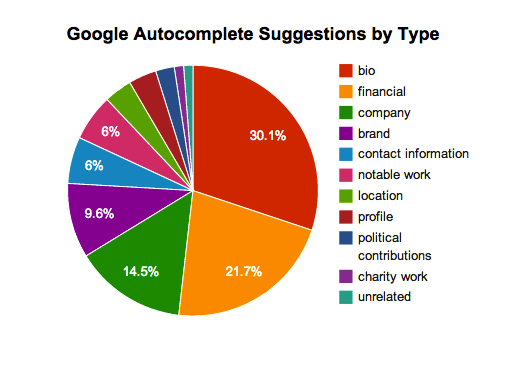 Search used to be an automated land of rankings. Then us SEO’s figured out how to play the game and Google had no choice but to hand pick the results in the most competitive verticals. Hope you enjoyed the post. Feel free to post your TW favorites in the comments. The post A Threadwatch Best Post Revival. appeared first on . A Business’s Reputation Is More Vulnerable on the Social Web was originally published on BruceClay.com, home of expert search engine optimization tips. The lesson the Atlantic draws from the evidence is that the more trusting the community and the less centralized its communication, the more vulnerable it is to believing misinformation. Facebook is susceptible to propagating falsities with viral while Reddit collectively scrutinizes. It’s better to a safe skeptic than a sorry sucker. What are people saying about your business online? Word of mouth has been amplified with social SERPs. The findings are a cautionary tale for citizens of the web who avoid becoming victims. But the implications for businesses are equally pressing. A tarnished reputation can do serious damage to a business’s viability. If falsehoods or negative reviews of a business or people close to it crop up online, corrections or rebuttals can come too late to mitigate lasting damage. Active reputation management has always been a necessity of online business, but emerging search and social integrations magnify the issue. Yesterday Bing launched its new socially enhanced search interface. Billed as another leap beyond blue links, the three column format dedicates the right-hand column to social activity in the searcher’s network. Reviews, both good and bad, become more visible when members of a searchers network have made comments about a business. Google has also made clear its intentions to continue to add social signals to rankings as well as SERP display, saying We think the web is better when it’s social. Address your online vulnerabilities, be they from negative SEO sabotage or increasing prominence of social mentions. What’s being said about your business online? Isn’t it time to find out? What if I told you that you could reduce reputation problems, provide great customer service, strengthen your brand, and live according to your values and mission through a single marketing tactic? The answer lies in fruit. Yes, fruit. Around the Outspoken Media office, we’ve been on a big corporate social responsibility kick. 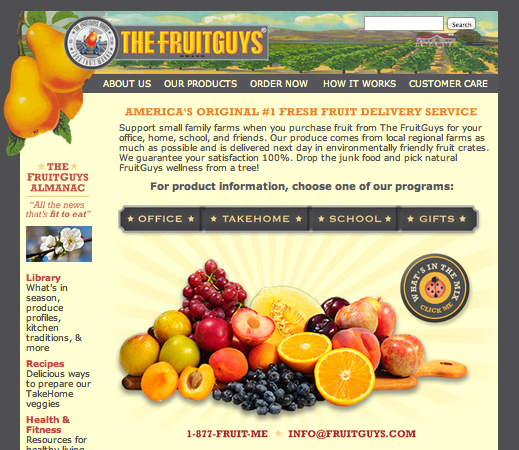 It’s one way we convey our values, so when I stumbled on a “fruit delivery” service from The FruitGuys, I had to know more. 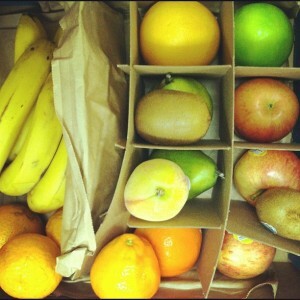 They provide a corporate delivery solution for local and organic produce. Fantastic! I’m a big environmentalist and the team has a love/hate relationship with carbs. This service could provide a healthy, environmentally friendly alternative to office snacking. Happy Account Registration Day to you! 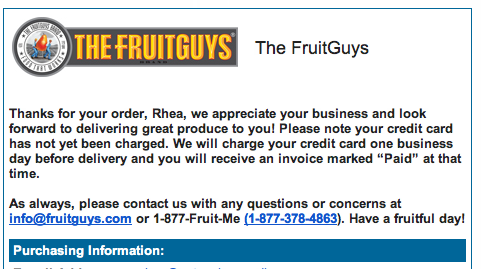 Once I told the team about The FruitGuys service, there was no turning back. I placed our first order for a recurring weekly delivery. Follow up with fans to increase conversions and nurture a lead pre-sale. Follow up with your customers to give them your preferred methods of communication. 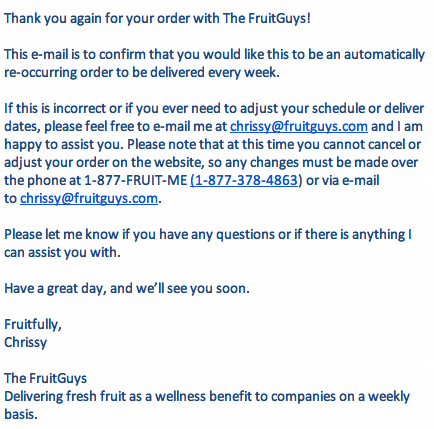 The day after I placed our order, I received another e-mail from The FruitGuys, which was to confirm that my order was meant to be a recurring shipment. 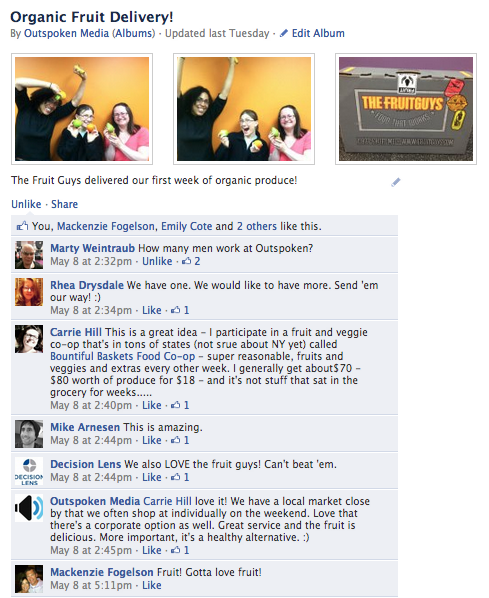 Unlike the first two e-mails, this came directly from an account rep at The FruitGuys. Now I had the name, e-mail address, and phone number of a real person at the company in the event of a question or concern. I confirmed, and they thanked me for our order. 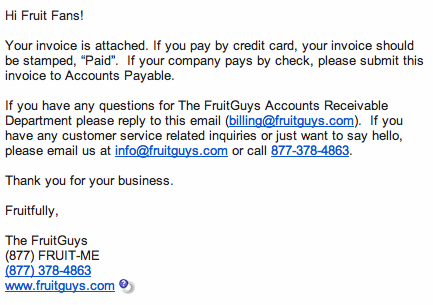 At this point in the follow-up process, it struck me that The FruitGuys had their own language: “Hi Fruit Fans,” “Fruitfully yours,” “Enjoy and be fruitful!” and “Happy FruitGuys account registration birthday.” This was communicated through automated e-mails, and by their team. Follow up to infuse your brand through messaging and tone. 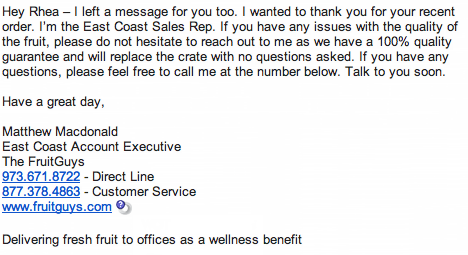 He gave me his e-mail address, his phone number, and the main customer service line. Follow up personally to further define exemplify your values and mission. Follow up to communicate your process for how to handle customer complaints. 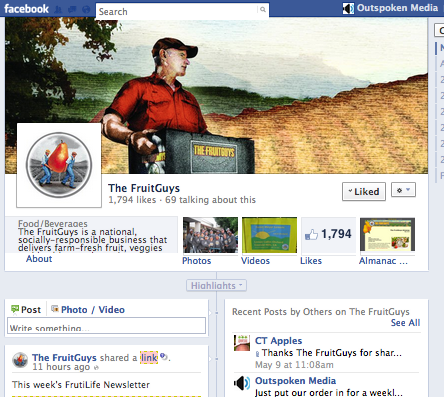 Before receiving our fruit, we were so excited that we Liked The FruitGuys on Facebook. 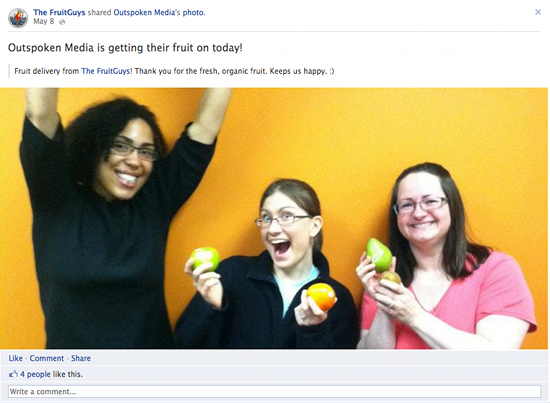 They asked us to take a picture when we received our fruit. Follow up to establish a strong online community and spread word of mouth marketing. What’s the secret to reducing reputation problems, providing great customer service, strengthening your brand, and living according to your values and mission? That’s it. Find opportunities within your organization to increase follow-up and infuse your communication with each of the aforementioned goals. At Outspoken Media, we’ve recently signed on with InfusionSoft to help us intelligently automate newsletter sign-ups and contact forms. 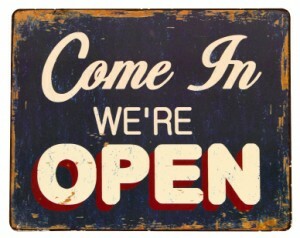 We recognize that as a small shop, it’s difficult to manage the sheer number of inquiries we receive daily. We have to turn to technology to help us scale, but in the process, we don’t want to lose our voice or compromise our values. Below are several tools you can use to improve follow-up, and please take a minute to share your experiences in the comments below. Guess what else follow-up helps with? Link building and outreach. Make sure your team has a process for follow-up, and hold them accountable to it. You’ll see a much higher success rate if you do. If you have trouble managing your inbox, check out Tom Critchlow’s recent post on project management to hone your skills.